As much as I try to seek out quality local companies, I have missed some real gems. 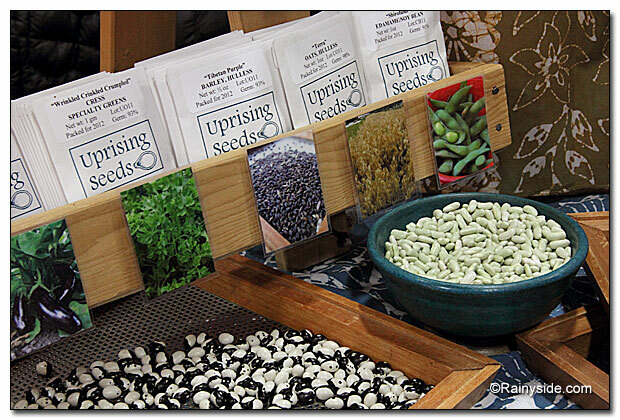 Online last week, a local gardener brought Uprising Seed, a Northwest company, to my attention, and today I spotted their booth at the Mother Earth News Fair in Puyallup. Serendipity. It was a sign for me to stop by to meet them, and learn more about their products. I am glad I did. Owners of the seed company, Brian Campbell and Chrystine Goldberg were delightful to chat with; it was obvious they knew their product. Market growers for many years, they know the best seeds for maximum quality and reliability to grow in our maritime climate. It was a natural evolution to go from growing seeds for the market to providing the best seed available for the Northwest farmer and gardener. 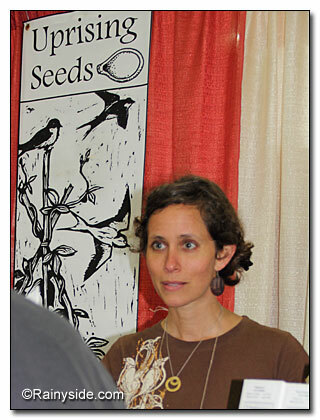 Their seed is one hundred percent organic; they have made a pledge that they are opposed to GMOs. Their focus now is strictly seed production, breeding and testing varieties. Most of their seed comes from a network of Northwest based growers. Campbell and Goldberg trial 95% of their product to see how they grow in our region; this makes me confident that the seed I purchase from them is going to work in my garden. Half the battle is won when a product is trialed for the challenges of our cold springs and mild summers. The rest is up to us seed growers, and of course, the weather gods. Check out their offerings and request a catalog at Uprising Seeds.